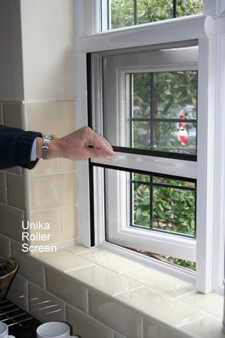 The Unika roller blind mesh fly screen is an unobtrusive method of keeping flies out of your home or business. When your window is closed the roller blind mesh fly screen is discreetly retracted into the top cassette. When you want to open your window you simply pull down the mesh flyscreen and lock it into position. VIP Fly screens are the market leaders in retractable roller blind mesh flyscreens and we have a wide range of sizes to suit any type of window. Our retractable roller blind insect fly screens are easy to use and they are available in vertical orientation to suit most windows. Retractable roller mesh flyscreens are suitable for both commercial and residential use and are one of our best selling fly screens. Our retractable roller blind mesh flyscreens are tidy, neat and very discreet. Our retractable roller blind mesh flyscreens give you stylish window flyscreens that disappear when you don't need them. These retractable roller blind fly screens stop flying insects just like any other ordinary fixed fly screen and when you don't need them they can be effortlessly rolled up. Our retractable fly screen is conveniently stored in a cassette that prevents the mesh flyscreen from being damaged when not in use. All of our roller blind fly screen windows use high quality meshes and hardware so by installing one of our series of retractable roller blind insect flyscreens, you can be assured that your family and loved ones are protected from annoying insects and the diseases that they carry. Our mesh fly screens allow you to open your windows to enjoy the view but keep the bugs and flying insects out even when you have your lights on. Our modern and affordable retractable insect mesh flyscreens are offered in either kit form or ready assembled. When fitted our flyscreens look both neat and attractive. The retractable roller blind fly screens are so simple to install and form a complete sealed unit to your window frame or reveal. It can be vacuumed for ease of cleaning. We guarantee that you will be pleasantly surprised with the quality of our retractable roller blind mesh flyscreens and our affordable prices. Your roller blind mesh fly screen is very easy to fit, requiring only the side guides and cassette to be cut to size, the components then slot and screw together. Colour - Profile and fittings are white, with grey mesh. Easy to size - adjustment to our roller blind mesh retractable fly screen only requires trimming the side guides and cassette to your required size. Easy to fit - once cut to length, components slot and screw together. The whole roller blind mesh flyscreen is easily fitted requiring you to have only basic tools and DIY knowledge. Our spring assisted roller mesh flyscreen is made with a durable powder coated aluminium profile and a rot-proof PVC coated woven fibreglass mesh. The roller mesh fly screen represents a good quality and long lasting product which is perfect for any home or business. Our roller blind mesh flyscreen is available in 6 width sizes that can all be trimmed down to fit your window. 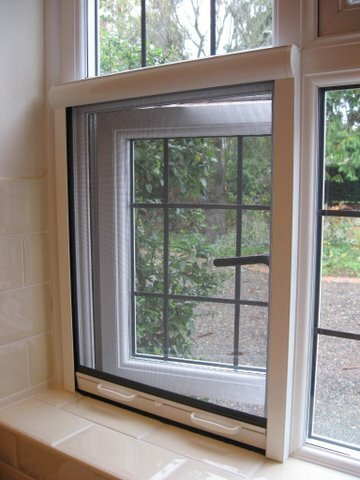 All our kits will fit windows up to 1,450 mm (57") high, however, if you prefer, we can cut the roller mesh fly screen to your required size and assemble it for you. To help you we have a downloadable measuring guide - the link for this is located just above the "Add to Cart" button. We can assemble the roller mesh flyscreen for you for an additional £6.00 cost including VAT. When ordering your roller blind mesh flyscreen please select the assembled option, select the width size above the size you require, and also tell us the finished size you require in the box below. To help you we have a downloadable measuring guide - the link for this is located just above the "Add to Cart" button. There is a carriage charge of £10.50 including VAT although this may change depending where you live, or if you purchase more than one screen. To avoid the roller screen "snapping" shut we also offer a control brake which allows the screen to retract in slow controlled manner. The brake fits inside the cassette so is not visible from the outside.